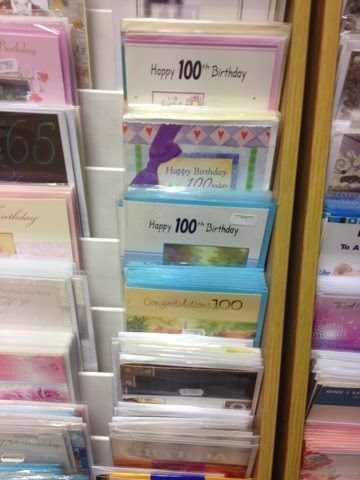 Surely this must be the only shop in the world to stock six different varieties of a 100th birthday card! Sadly, if you're 101 years old you are out of luck. No card for you I'm afraid. This is normal in my town. In fact I couldn't get a I am 7 badge for my son, but I could get loads of I am 100. Crazy, but we are all living longer. You'll be glad of those cards and badges in the future.